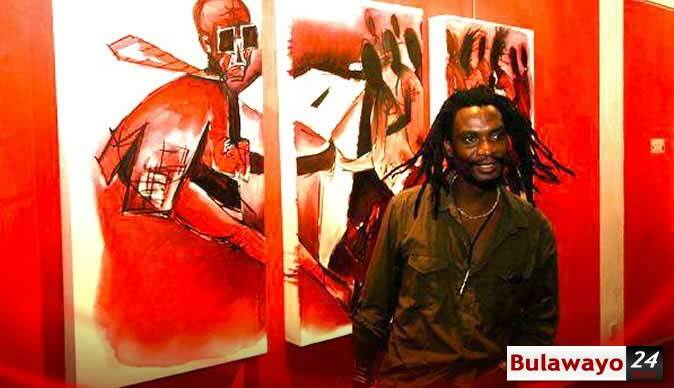 It's exactly three years since visual artist Owen Maseko lost his fight to exhibit the controversial Gukurahundi-inspired paintings at the Bulawayo Art Gallery. Before the Supreme Court issued its order in April 2015, instructing the renowned artist to pull down his paintings — police had aggressively pursued his works following a highly contested ban — which occurred in 2010 as then president Robert Mugabe and his minions clamped down on protest art. Nothing has changed, as he remains banned from exhibiting Sibathontisele (Let's Drip on Them), an allusion to blood and torture used during the atrocities. "Sibathontisele was banned and it's still banned under the so-called new dispensation. The fact that Zanu-PF is still in charge, it means most of those people who were against the exhibition . . . are still there hence they will obviously not want it out because of their role during the era," Maseko told Southern News. The plucky artist still strongly believes that the people of Zimbabwe still deserve to be given an opportunity to view the Sibathontisele exhibition, adding that it was their right to make their own judgments. "Lately, I have been contemplating challenging the ban at the court, because personally, I think it's an affront to the freedom of expression in the country. We are not politicians, but artists merely expressing ourselves through art, but this thing of criminalising art should be addressed by relevant authorities," he said. Maseko said he was consulting his lawyers regarding the court appeal. He said the Gukurahundi atrocities cannot be swept under the carpet, adding that redress and reconciliation was an urgent necessity. If anything, Maseko does not regret coming up with the exhibition that courted the attention of international human rights activists. "That exhibition was the best thing ever to happen in my career. That exhibition made the issue of Gukurahundi to be spoken about publicly and in different fora, in and outside the country." "And that's what arts should do. It should stimulate debate among societies. It's important for people to have open dialogue on this matter. There should be peace and reconciliation. It can't be just swept under the carpet, yet we are talking of over 20 000 that were killed in cold blood," Maseko told Southern News. He, however said despite the intimidation and persecution at the hands of State security agents, he was no quitter. "I am not afraid of doing any exhibition of that nature because that's my passion; it runs in the veins, it has got nothing to do with the politics of the day. "I am very aware that as a human rights activist through art, I should not worry about things that I have no control over. The work I do is more than my fears, the risks are always there in any field," he said. The versatile artist who has diverged into music and book publishing appealed to the government to respect freedom of expression and human rights. Maseko's works — three installations and 12 paintings, featuring violent recollections of the 1980s deaths of 20,000 people in the Matabeleland and Midlands regions, briefly opened at the gallery in March 2010. Police swooped on the exhibition and violently shut it down. They used newspapers to cover gallery windows through which "Two Dissidents" — figures of a man and a woman hanging upside down — could be seen from the street. He challenged the police ban before the eventual ruling by the Supreme Court in 2015, ordering him to pull down his artworks. The highly-emotive Gukurahundi atrocities — which occurred between 1982 and 1987 when government unleashed a North Korea-trained army, the Fifth Brigade, to crush insurrection in Matabeleland and Midlands regions, have remained a thorn in the flesh of Zanu-PF government. Recently Zapu president Dumiso Dabengwa claimed that the number of people killed during the Gukurahundi atrocities is over 100 000 — dismissing the official figures of 20 000 which was compiled by a local rights group — which government has also doubted. This followed claims by Mugabe that Zapu and Zipra were also responsible for the atrocities. "Zapu and Zipra are also to blame. "I doubt the number (of those killed), but well it would-be because you get some people with guns behaving recklessly," said Mugabe during interviews with a selected journalists, at his residence in Harare, last month. "He (Mugabe) remains the same unrepentant blood dripping monster who hid behind a thin finger of madness when he killed hundreds of thousands during Gukurahundi, blaming everyone except himself. "His denial of the 20 000 deaths shows he really is mindful and aware of the magnitude of his madness. Mugabe is fully aware that these 20 000 are direct deaths at the hands of the Fifth Brigade. "The number does not include curfew-induced deaths of children, the elderly and the sick from malnutrition, hunger and disease and (these) were never accounted for. "He fully knows that Gukurahundi deaths run into hundreds of thousands, hence his refusal to acknowledge the mere 20 000 that was given by the CCJP, whose incomprehensive survey or investigations only covered Matobo and Tsholotsho districts," Dabengwa told Southern News last month. The Catholic Commission for Justice and Peace in Zimbabwe (CCJP compiled a report on Gukurahundi atrocities in Matabeleland and the Midlands during the period of 1982-1988 titled "Breaking the Silence: Building True Peace". According to the CCJP an estimated 20 000 people were slain by the North Korea-trained Fifth Brigade in Matabeleland and Midlands provinces, during a government operation it said was aimed at fighting insurrection in those regions. President Emmerson Mnangagwa, who served as Mugabe's right-hand man for nearly 54 years, in January signed into law the National Reconciliation Bill, which seeks to address outstanding issues from previous conflicts — Gukurahundi included. Last month, he appointed a former High Court judge Sello Nare to head the National Peace and Reconciliation Commission (NPRC), two years after the death of Cyril Ndebele who chaired it. During his maiden appearance at the World Economic Forum in Davos, Switzerland, in January, Mnangagwa said government was keen to address Gukurahundi atrocities.